On arrival in Srinagar International Airport, an altitude of 1730 Mts. Meet our assistance at the airport & drive by car to the Srinagar city (Sri = means Lakshmi or Wealth & Nagar means a city) transfer to hotel. Afternoon visit Mughul Gardens NISHAT (The Garden of Pleasure) built by Asif Khan brother in law of Jehangir in 1632 AD. And SHALIMAR (Abode of love) built by Jehangir for his wife Empress Noor Jehan, Cheshmashahi Garden ( A Royal Spring). All the gardens are situated on the bank of Dal Lake with the Zabarwan Mountains in the back ground. Enroute visit SHANKARACHARIYA TEMPLE famous for Shiv temple of Srinagar which is situated near Dalgate above 305 mts above on the hill to see it you have to ride 242 steps. According to historians this temple got constructed by the Jhaluka, the son King Ashoka 200BC. From the temple you can see the panoramic view of Srinagar City. Evening return to your reserved Hotel for dinner and overnight stay. After breakfast full day trip to SONMARG THE MEADOW OF GOLD - 88 Kms from Srinagar will be covered about 2-½ hrs. Enroute you can visit White Mosque (Hazratbal Shrine)The holy relic Moi = e = Muqqadas is placed at Hazratbal. Sonamarg lies in Sindh Valley streamed with flowers and surrounded by mountains Sonamarg is also the base for some interesting treks to the high altitude of Himalayan Lake. The SINDH RIVER that meanders through the valley abounds with TROUT. Island Retreat Park 4km before the main Sonamarg market, a delta amidst Sindh River on Sonamarg road is a common stopover for the travelers. The wooden bridge over Roaring River leads to the park making, it a memorable scene.On arrival in Sonamarg visit the everlasting Thajiwas Glacier, 3km from Sonamarg, provides a chance to enjoy sledge ride on the snow even in mid summer. Ponies can be hired for the trip up to THAJIWAS GLACIER Evening return to Srinagar hotel for dinner and overnight. After early breakfast drive to Gulmarg Meadow of Flowers - 2730Mts. Above sea level old name (Gaurimarg,).the green carpeted meadows offer a pleasant view to tourists. The distance of 56 kms will be covered in about 1 ½ hrs. Gulmarg is famous for Ski Resort & the world’s highest 18 hole Golf Course and perfect level of slopes to the golfers the Asia’s highest golf course is also a part of beauty in Gulmarg.. One can also have the view of Nanga Parbhat if weather permits. The View enroute from Tangmarg to Gulmarg is fascinating. On arrival in Gulmarg check in at your reserved hotel. You can take to a Cable Car ride which is completely computerized and goes upto top which is highest in the world at an altitude of 14000 fts. One can enjoy the breath taking view of snow capped mountains while going upto the Ist phase known as Kongdori [3045 mtrs] or Iind phase known as Affarwat [4060 mtrs] a famous ridge that offers adventures slopes for downhill skiing /snow boarding. A sledge or Ski can be hired when slopes are covered with snow.One can have a short trek upto Khilangmarg which can be covered in about 3 to 4 hrs.Evening return to your reserved houseboat for dinner and overnight. After breakfast, full day excursion to Pahalgam VALLEY O SHEPHERDS drive through Saffron fields, visit Awantipura ruins (1100 years old temple of Lord Vishnu built by King Awantiwarman). En route visit Mattan Temple few kms ahead of Anantnag, a pond full of holy fishes is believed to be creations of Lord Shiva. Drive through the pine forest and along Lidder River. The total distance of about 96 kms will be covered in about 2 ½ hrs. On arrival at Pahalgam one can enjoy a pony ride through thick pine forest, enjoy the nature & walk around the banks of River Lidder. 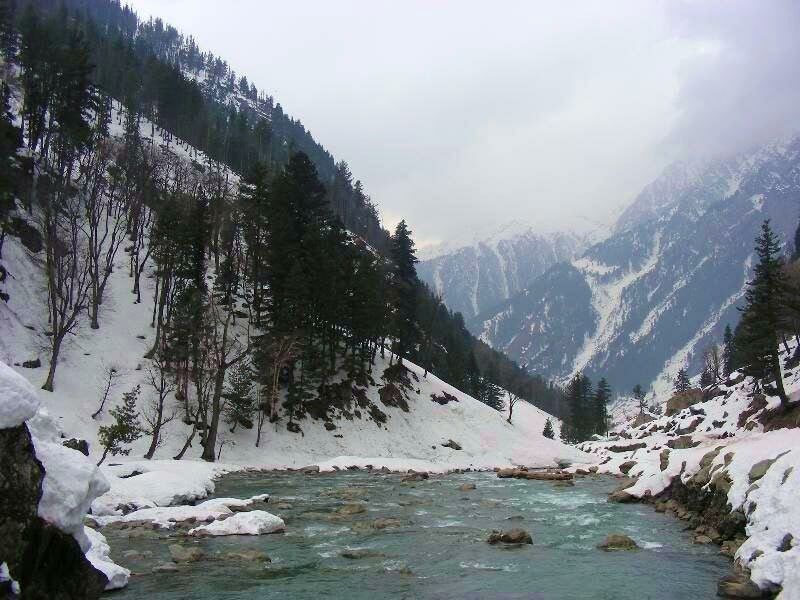 Pahalgam is famous for some trekking routes also & is the base camp for AMARNATH PILGRIMAGE. You can visit Aru Valley A village offers wonderful peculiar life style of the people 16 kms from Pahalgam by ponies or car of your own cost. 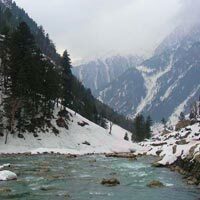 Chandanwari 16 kms from Pahalgam by ponies of your own cost. You can also visit Betab Valley 4 kms from Pahalgam by ponies famous for many bollywood film shootings. You can visit to Baisaran (Mini Switzerland) on ponies (on extra cost) the huge meadows surrounded by thickly wooden forests of pine present a beautiful spectacle. Evening return to Srinagar Houseboat for dinner and overnight stay.